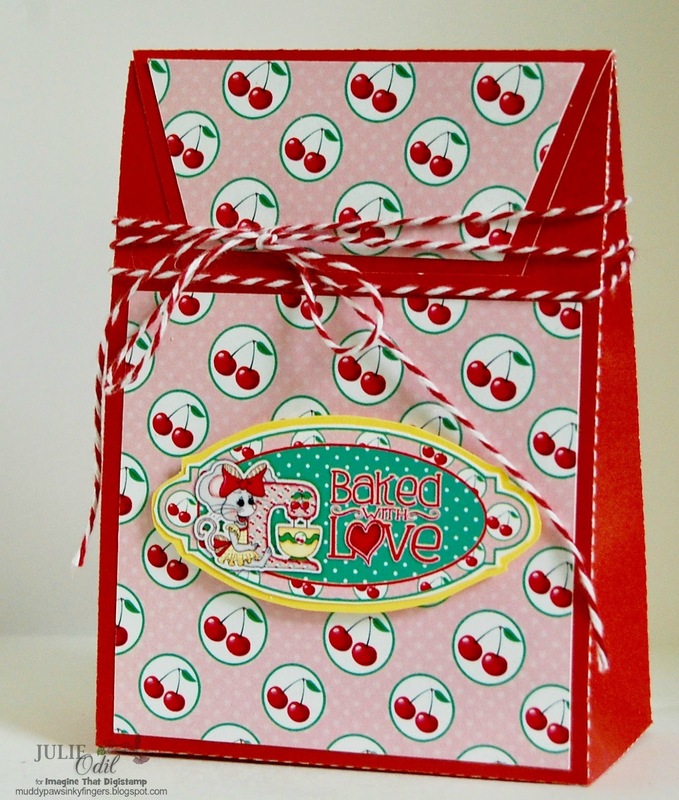 I created this treat bag using my Silhouette Cameo. I used one of the pre-printed tags from the Sweet Mice Tags & Labels, and the Tooty Fruity cherry paper matched it perfectly! A little twine wrapped around the treat bag, and it's ready for delivery. Baking the goodies for inside the treat bag -- now that would be more work. I'll buy those at the bakery! 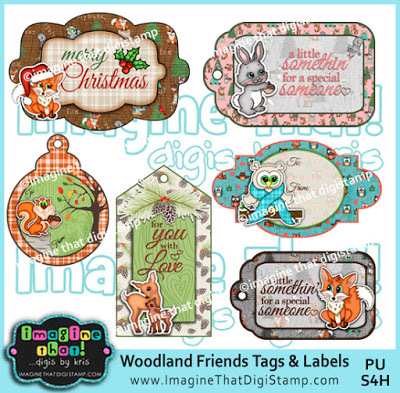 I fussy cut one of the Woodland Friends Tags & Labels, then used various tag dies to create the layered tag. A few fibers from Close To My Heart finished off this simple yet effective tag. I hope you enjoyed these 2 projects. There's much more inspiration to be found on the Imagine That! 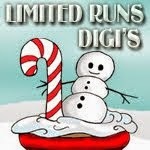 Digis by Kris blog and the Imagine That! Digistamp Facebook Group. Use this promo code to get 50% off of the new releases for a limited time!! 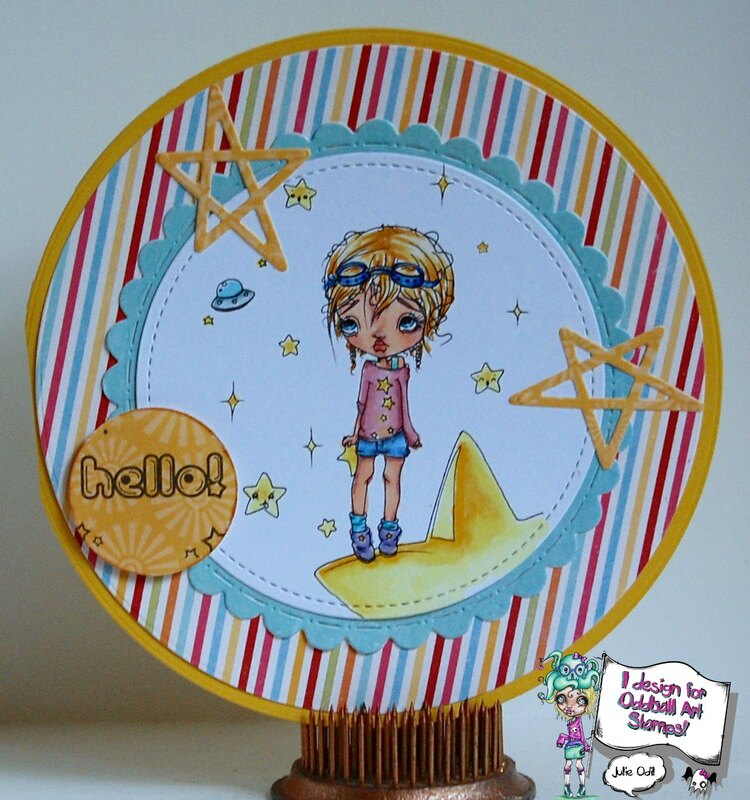 It's time for a bit of mid-challenge inspiration over on the Oddball Art Challenge blog. This month, the theme is 'Going in Circles'. I can do that easily enough, so the challenge should be easy, right? Once I got the effect I wanted, I used circle dies to create the card. 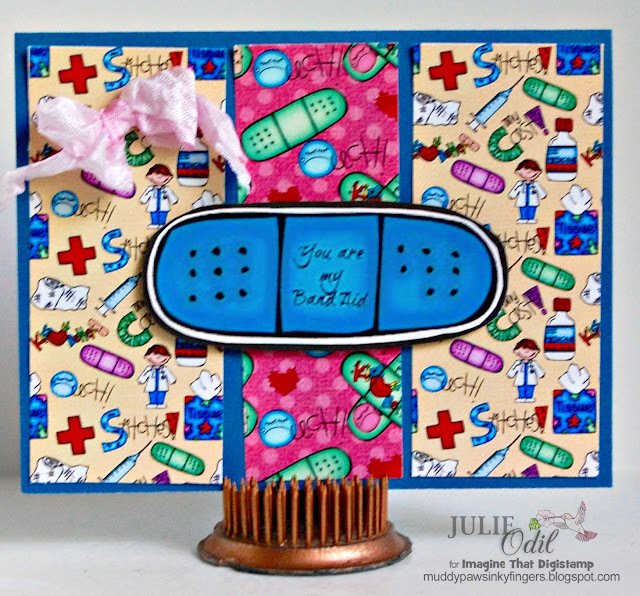 The stitched circle die is from Craftin' Desert Divas. The circle background die is form Spellbinders. I used a circle punch on the sentiment (also from Craftin' Desert Divas). The waves background paper is from Imagine That! Digis by Kris. The purple shimmer trim is from Close To My Heart. Do you need #323 - Sid the Silly Seahorse in your own collection? Been eyeing some other Oddball Art goodies? Did you see yesterday's new release? 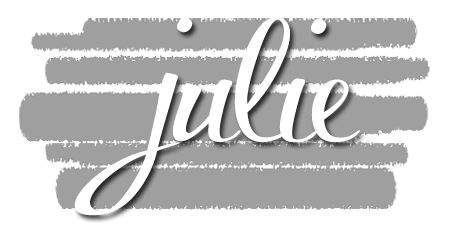 Check out the Oddball Art Etsy store, and use discount code DTJULIE10 to get 10% off of anything in the store! Yea! 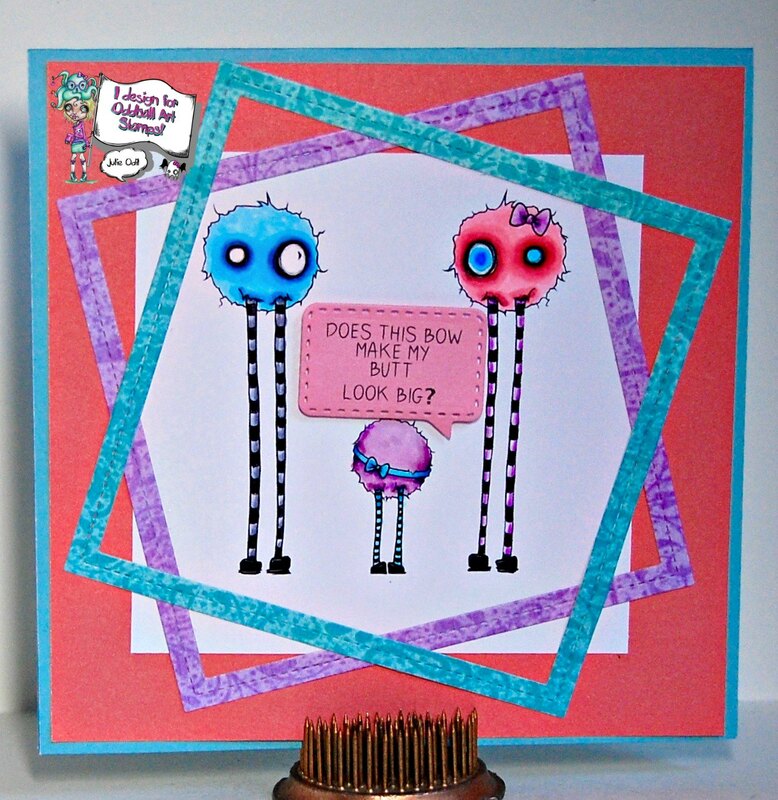 Then, with new digis at the ready, come join the circle challenge at the Oddball Stamps Challenge blog. Don't forget our Anything Goes with Oddball Art images challenge on our ODDBALL ART FACEBOOK GROUP CHALLENGE. We have a new challenge on the 1st of every month, so it's starting very soon! I had a bunch of different sentiments bouncing around in my head as I created this, but eventually settled on this one. Little Jone's seems worried, somehow. I colored Image #332, The Jones, with Copic markers. The frames were cut out with a Lawn Fawn frame die. 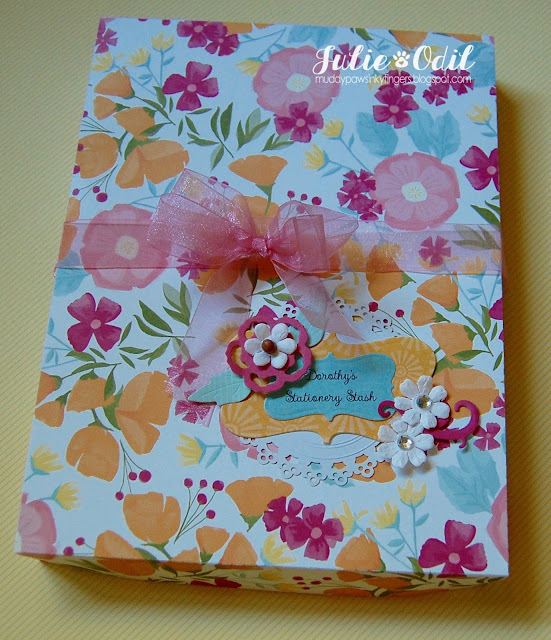 The designer papers are from MHK Designs. 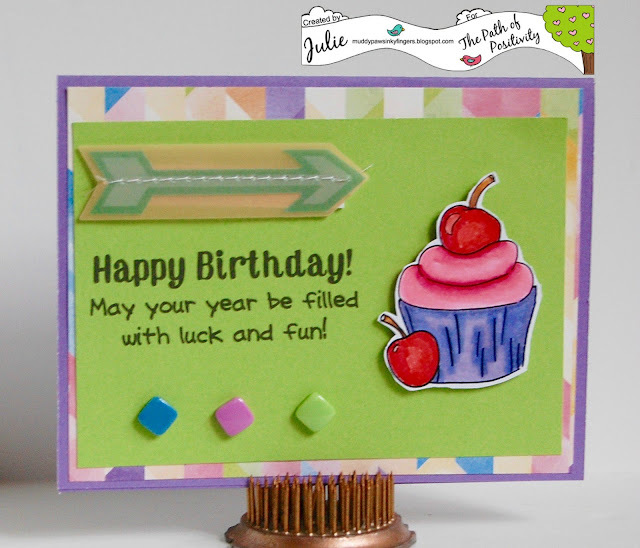 The sentiment was computer generated and cut out using a Spellbinders die. Make sure to check out the Oddball Art blog today to see the other great New Releases. When it's time to do some shopping, use discount code DTJULIE10 to get 10% off of anything in the Oddball Art Etsy Store! Join us again tomorrow on the Oddball Challenge blog for a little mid-challenge inspiration. There's still plenty of time to link up with our 'Going in Circles' theme. Here we are, closing in on the end of my 3 months of guest designing for Imagine That! Digis by Kris. It's been a great ride from start to finish, and I'm so glad for this opportunity! I love being out in nature. When I'm not at work or in my craft room, I find any excuse I can to be outdoors. I love to watch the changing seasons, listen to the birds, and see what I can see. We have a pair of Great Horned Owls that nest in the neighborhood. I seldom see them, but I hear them often, especially in the winter. I don't think today's owl looks anything like them, but he sure has personality, don't you think? Isn't he a hoot! I love that bluebird that has come to join in the fun! I really like that there are digi papers with this set. I used 3 of them on this card. I colored the Owl with Robin with Copic markers. The sentiment, also part of the set, was printed, then cut out with a banner die. I cut the tree branch out with my Silhouette Cameo. 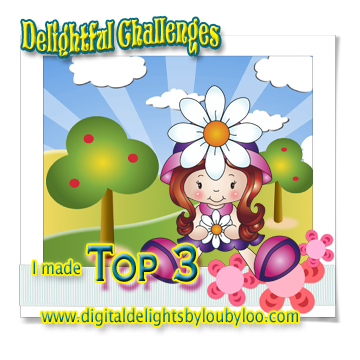 There's an Easy as 1-2-3 challenge going on right now in the Imagine That! Creative Playground. I'm going to enter this card, as there's still a few more days to play. I used a tree limb, 2 birds, and 3 patterned papers. Once again, I want to thank Kristy, Lisa, and the whole Imagine That! team for the wonderful 3 months! Woohoo! It's been a great, productive, crafty weekend for me. I hope whatever you've been doing, you've been enjoying yourself! I try to play along with The Outlawz Monthly Freebie Progressive Challenge each month. 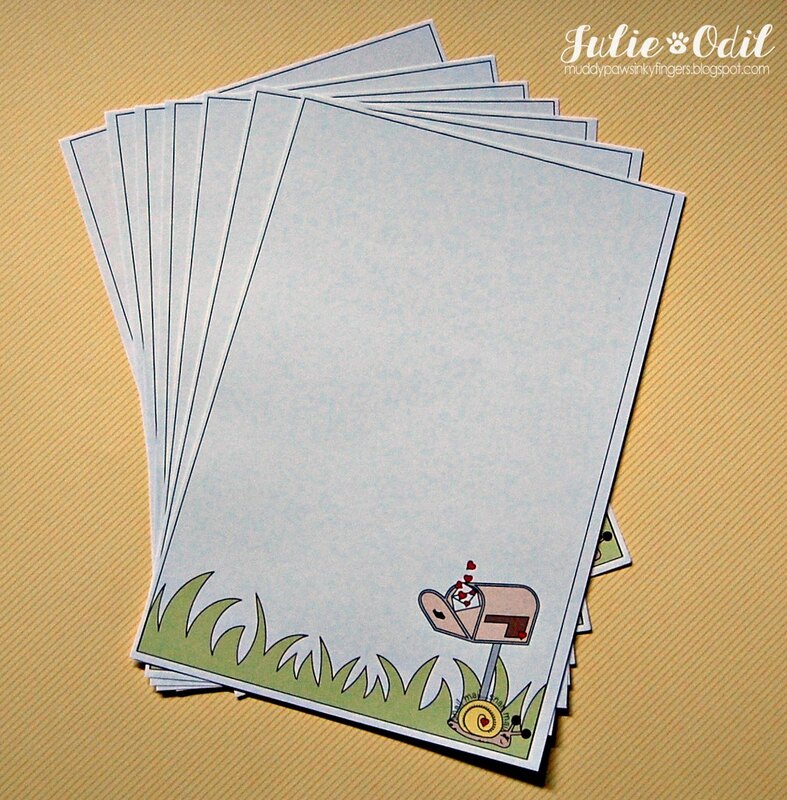 This month's freebie was generously provided by Di's Digi Stamps, and it's wonderful! I love coloring animals and I love sunflowers, so this mouse & sunflower digi was pure joy to color! 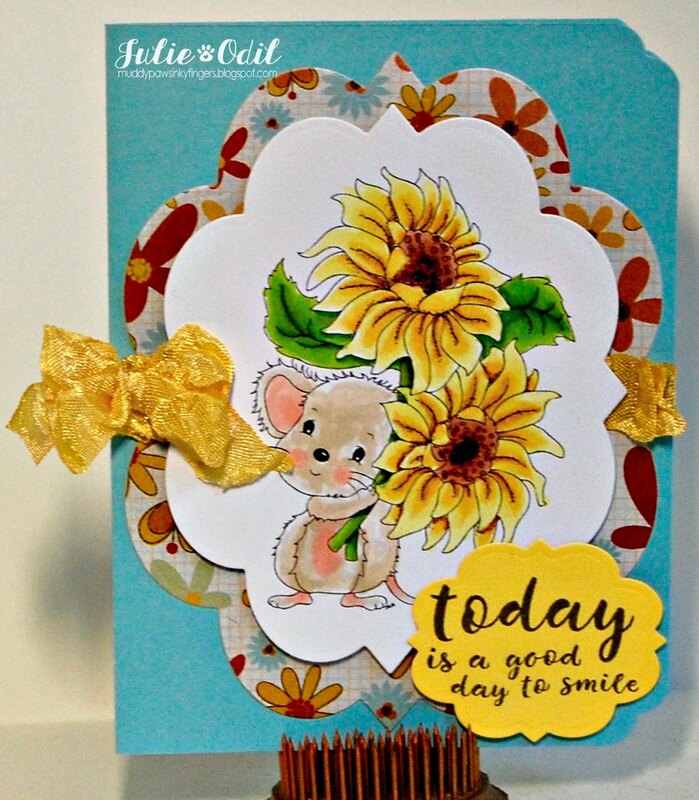 I colored the Mouse & Sunflower image with Comic markers, then used a Spellbinders label die in various sizes to cut it out and back it. I used a smaller version of the die to showcase the sentiment -- a clear stamp from a Simon Says Stamp set. The sunflower crinkle ribbon is from 3 Girl JAM. I also used my We R Memory Keepers scalloped corner chomper on this card. Happy Friday, fellow crafters! 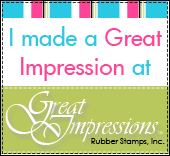 I have a Friday flash back for you today for Great Impressions Stamps. I'm sharing one of my favorite cards I've made since being on the design team. 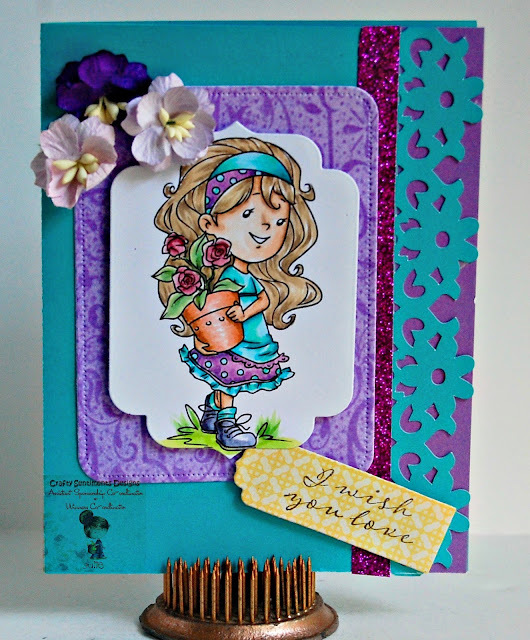 I created this card in the spring, but I think this stamp is wonderful anytime of year! I love this big, bold rubber stamp that is both image and sentiment in one. It is Great Impressions Stamps G364 Spring Special Thanks. I colored G364 Spring Special Thanks with Copic markers, then used a variety of dies to create the card. I cut the card base out on my Silhouette Cameo with a file I found in the Silhouette Design Store. The crinkle ribbon is from 3 Girl JAM. The stick pin is from Prima Marketing. 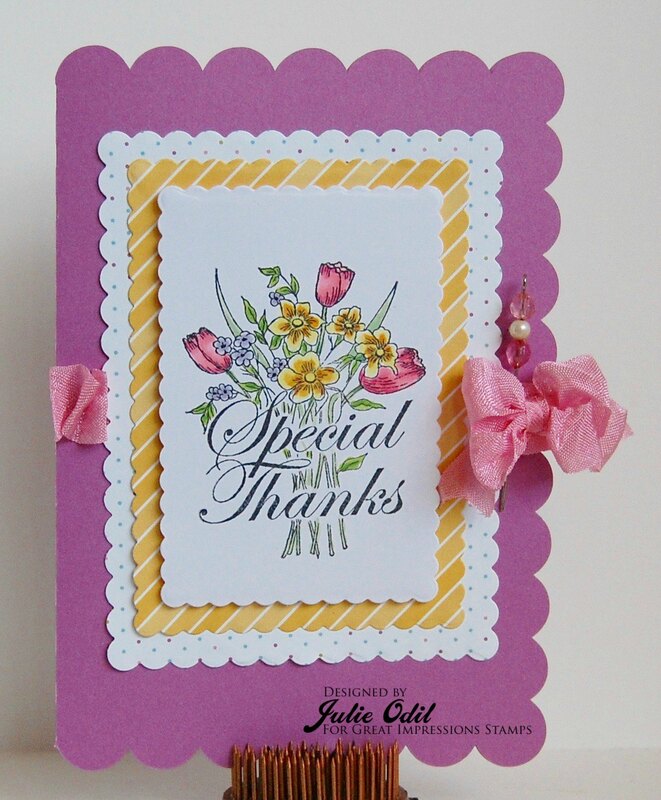 I'm forever in need of thank you cards, and I believe the recipient of this one will enjoy it anytime of year! You'll find this fantastic stamp, and many many more in the Great Impressions Stamps store. Greetings, crafty friends! 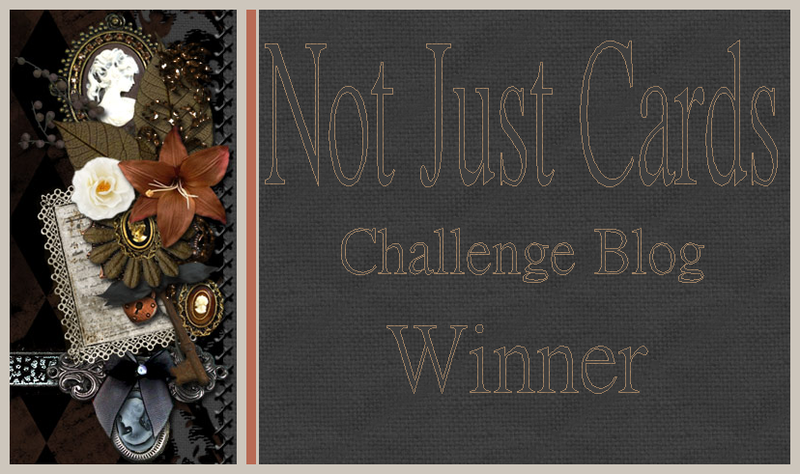 It's time for the September/October challenge on the MHKDesigns Challenge blog. I love the colors of fall, so this month's inspiration board was great fun! Isn't this fun?!? I used the Fabulously Fall Digital Stamp set to create this. 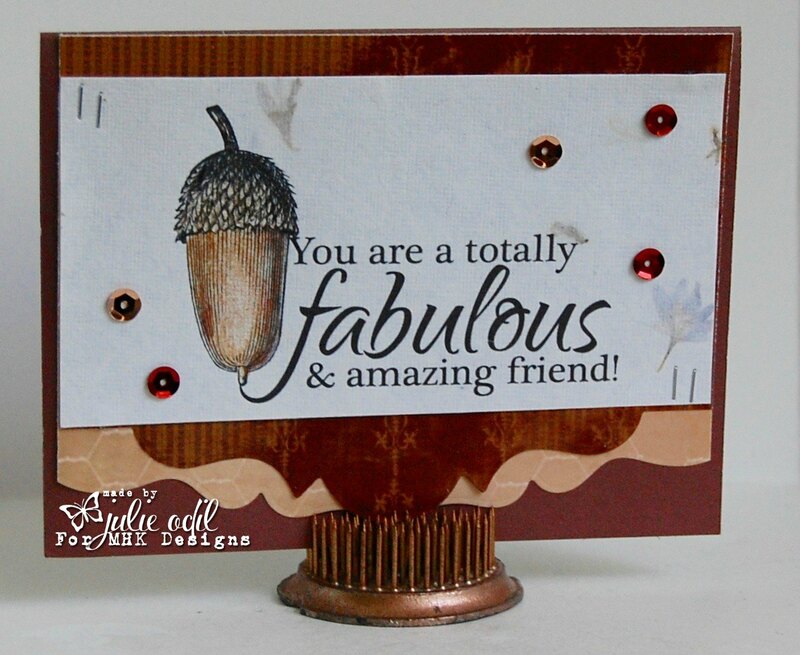 The acorn and the fabulous sentiment are both part of the set. 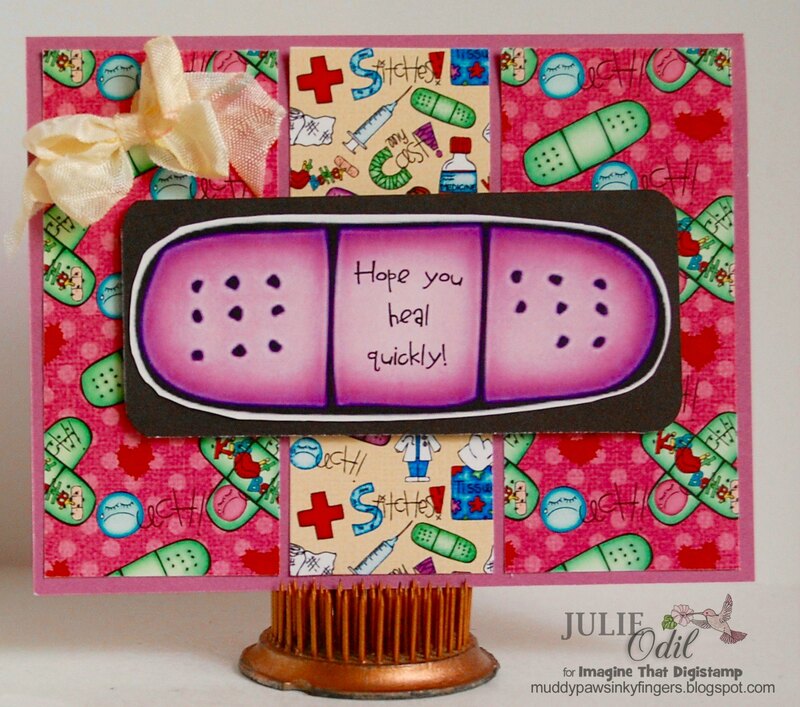 The papers on this card are also from MHKDesigns, and are found in the Etsy Shop. 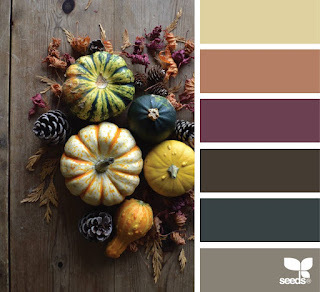 They are from the Fabulously Fall and Country Farm digital papers. 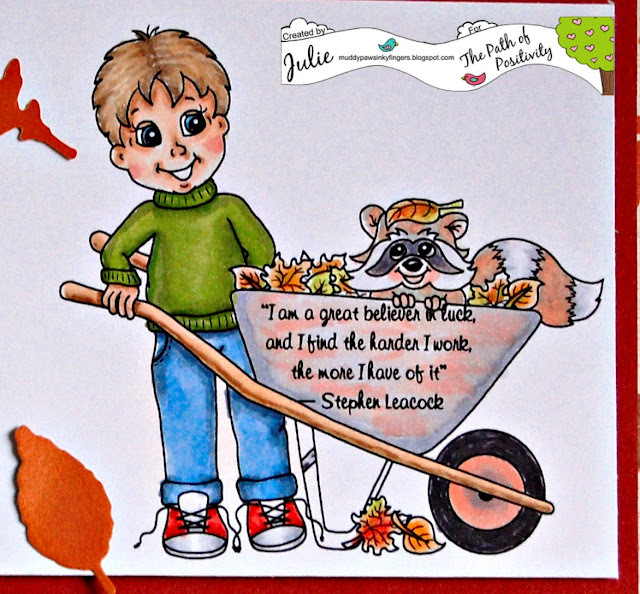 I used the Fabulously Fall digi stamp set and printed it on some hand pressed paper I've had for years. Then, I used Lyra Rembrandt Polycolor pencils on the acorn to shade it. I attached this layer to the card base with a Tim Holtz Tiny Attacher (stapler). The layered edges were made with dies from Paper Wishes/Hot Off the Press. The sequins are from Close To My Heart. 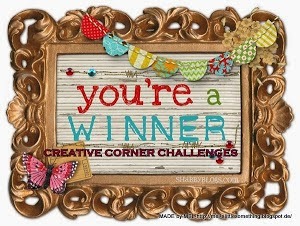 I hope you join in this month's challenge at MHKDesigns. You have a whole month! The theme is anything goes if you use an MHKDesigns image, and the mood board is available for any other image you might want to use. Come join us! 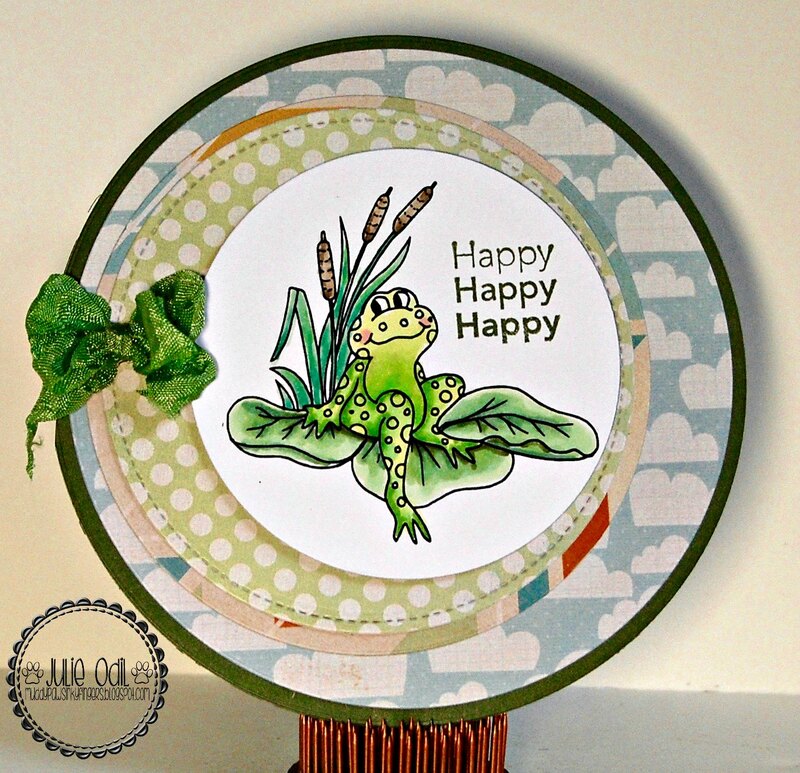 It's Tuesday, and time for a new challenge at the Crafty Sentiments Challenge blog. I'm the hostess this week, and the theme is 'For Someone Special'. Hopefully, we all have many special someones in our lives that we send cards to, so this should be an easy one! I have an elderly gentlemen who moved across the state many years ago now. He was a very faithful volunteer in the nursing home where I work for 13 years. I try to send him a card every week. Here's the card I'm sending him this week. He's a very patriotic man, so I think he's going to like this. 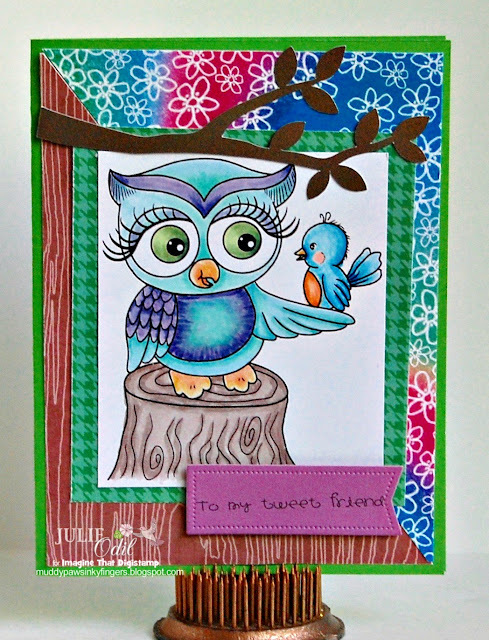 This card uses a rubber stamp from Crafty Sentiments Designs. It's Patsy & Gizmo - Flag. I colored the Patsy & Gizmo - Flag rubber stamp with Copic markers. The Americana backing papers are from the Imagine That! Digis by Kris Shop. The sparkly gold stars are from my stash. The sentiment is a stamp from Joy's Life. 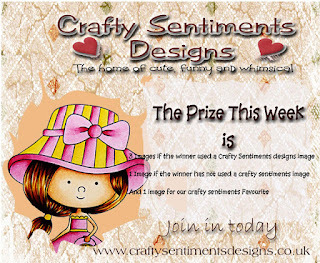 I hope you can join us this week for the 'someone special' challenge at Crafty Sentiments Designs. We have great prizes, and I'd love to see what you make! Join us in the Crafty Sentiments Facebook group, too, for contests, challenges, and even more inspiration. We'd love to have you! It's Monday, and time for some midway inspiration on the Path of Positivity Challenge Blog, where our theme this month is 'Luck'. Our sponsors this month are Limited Runs and Imagine That! Digis by Kris. Of course, eating cupcakes is lucky any time of year, but getting one this yummy looking is definitely lucky! I colored Double Cherry Cupcake 2 with Copic markers, then fussy cut it. Everything else on this card is from Close To My Heart. 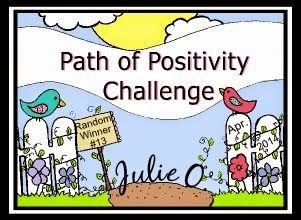 I hope you can join our luck themed challenge this month at Path of Positivity. It goes until October 2, so there's still plenty of time to link up! Happy Sunday, everyone! I'm spending the morning on the organ bench, then going for a walk with my BFF, and maybe getting a little crafting done. Wow, that wounds like a great Sunday, doesn't it? I'm posting today for the Cutting Cafe. 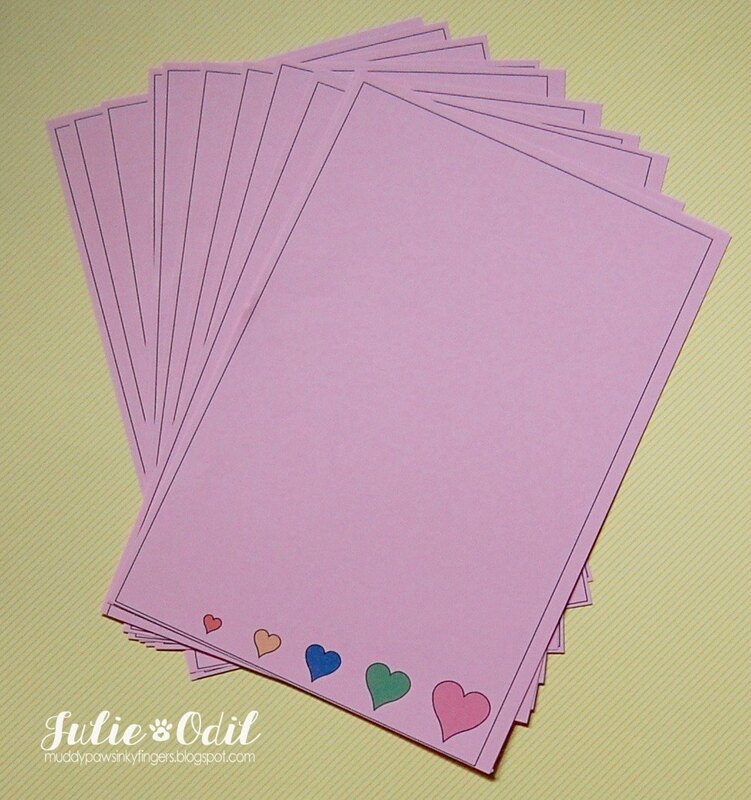 This week, all the design team is working with a new set in the store called 'Let's Write a Letter' Printable Set. Warning, there are a lot of pictures with this post! I have a co-worker who loves all things paper. She calls herself a paper whore. When we were assigned this set, I knew I had to make something for Dorothy! I used the SVG file that comes with the set to create the box. 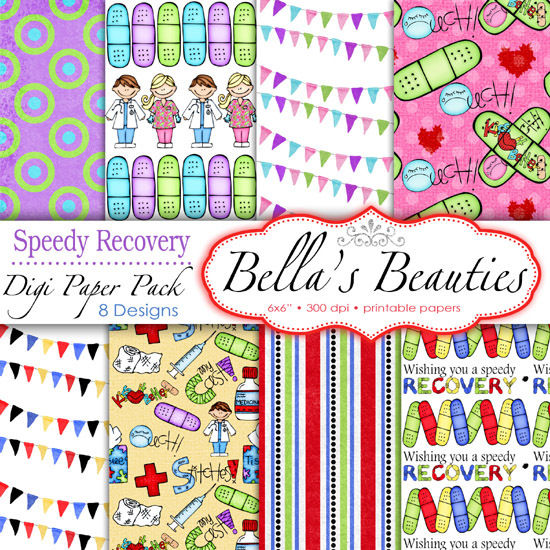 There are many printable designs in this set. Here are the designs I printed for Dorothy. I printed at least 8 pages of each design. 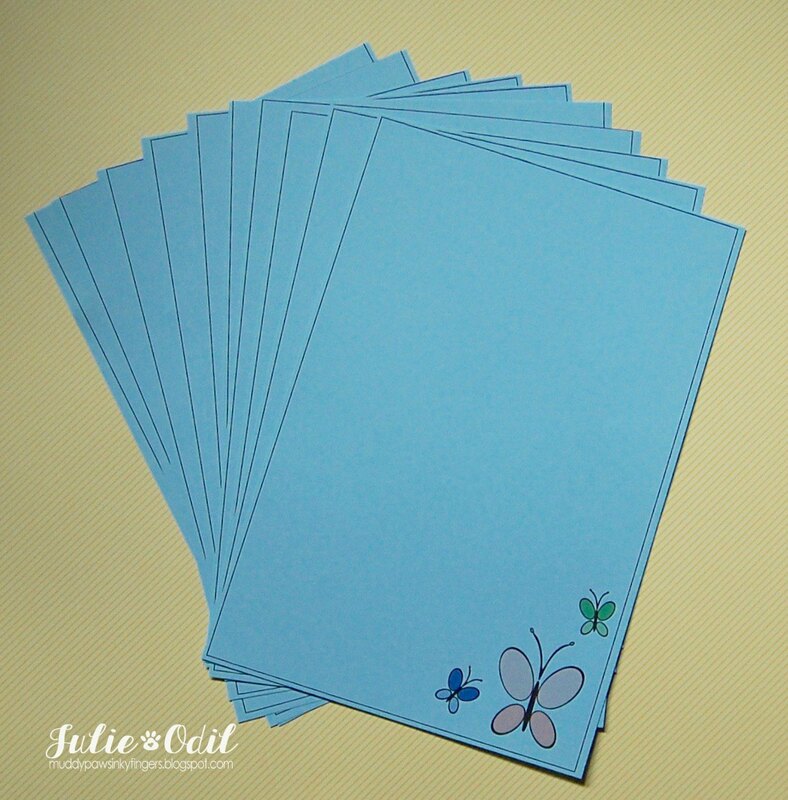 Stationery for a variety of occasions, don't you think? I know you like paper, and I know you like to write letters, so I made you your own, unique, stationery stash. Enjoy! Everything pictured is from the 'Let's Write a Letter' Printable Set, found at The Cutting Cafe. Visit The Cutting Cafe blog on September 21 to see what the other design team members created with this set. Leave a comment, and you could win 3 sets of your choice from the store. Check out the Cutting Cafe - Be Inspired Facebook Group, too, for more inspiration, friendship, and fun! 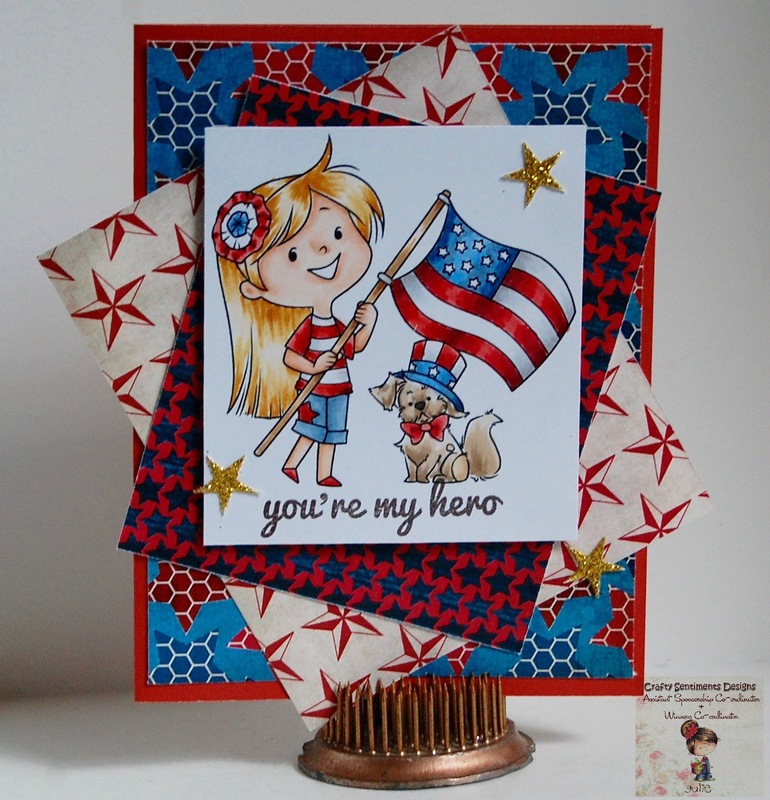 I'm posting today for Great Impressions Stamps, and I have a sweet, sweet card to share. This card uses Great Impressions Stamps F492 Fall Clean Up, and E550 Second Spring. The challenge goes all month, ending September 30, so there's still plenty of time to join us. Of course, we'd love to see a Great Impressions Stamps image, and there's incentive if you do! Do some shopping in the Great Impressions Store, too. 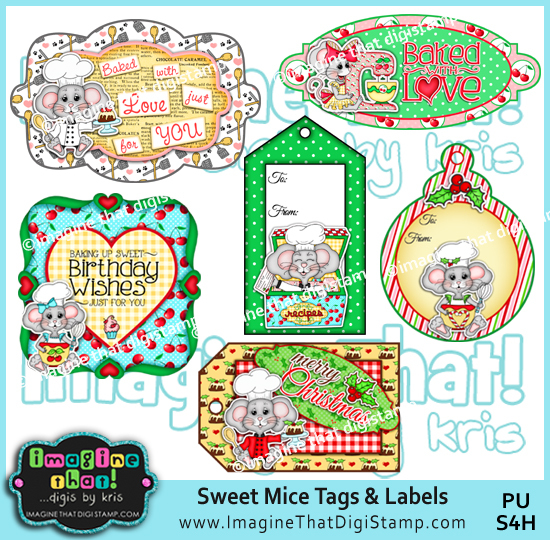 You'll find these 2 wonderful stamps there, plus so much more! It's the 15th of the month, which means it's time for a new challenge over on the Oddball Art Challenge Blog. This month, the theme is 'Going in Circles'. We want to see circles somewhere on your project. I colored Image #151 with Copic markers, then used a variety of circle dies from Craftin' Desert Divas and Lifestyle Crafts to create the card. 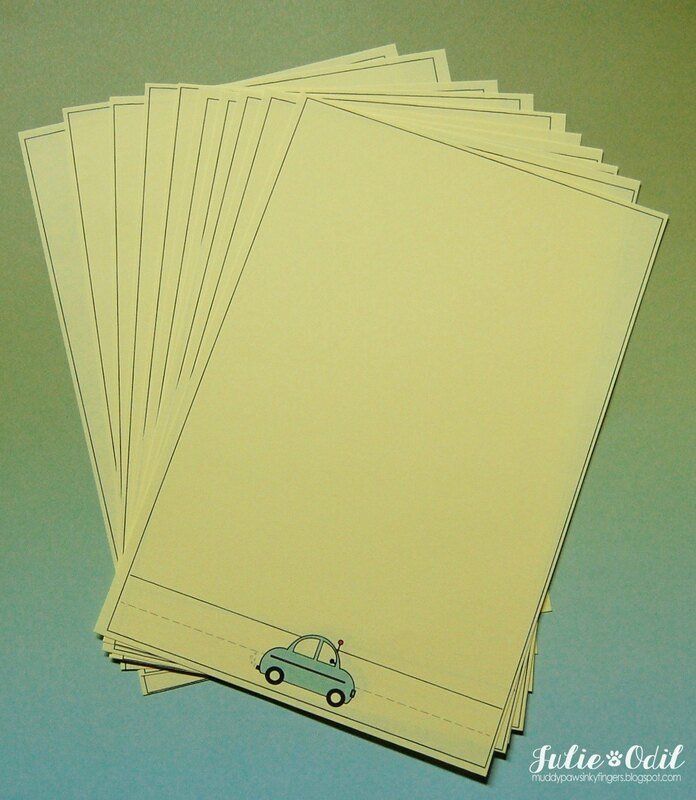 The papers were all printed, and were purchased from Snap Click Supply Company. The sentiment came with Image #151. There are lots of cute sentiments with Starla Jones. The star die cuts are from Close To My Heart. 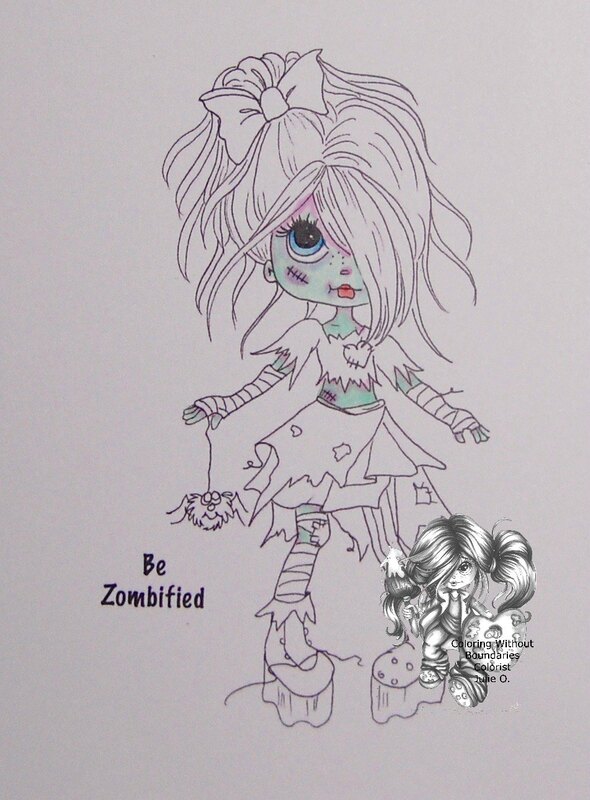 Isn't this a great digi stamp? Would you like her for yourself? Use discount code DTJULIE10 for 10% off of anything in the Oddball Art Etsy Store. Don't forget our Anything Goes with Oddball Art images challenge on our ODDBALL ART FACEBOOK GROUP CHALLENGE. We have a new challenge on the 1st of every month, so there's still plenty of time to enter. I hope you join us this month for the Oddball Art 'Going in Circles' Challenge. We have great prizes to win, and I'd love to see what you make! Happy Wednesday, crafty friends! 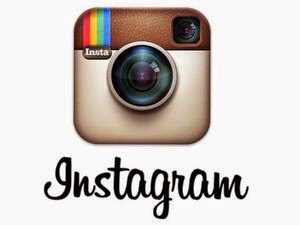 I'm posting today for MHKDesigns. 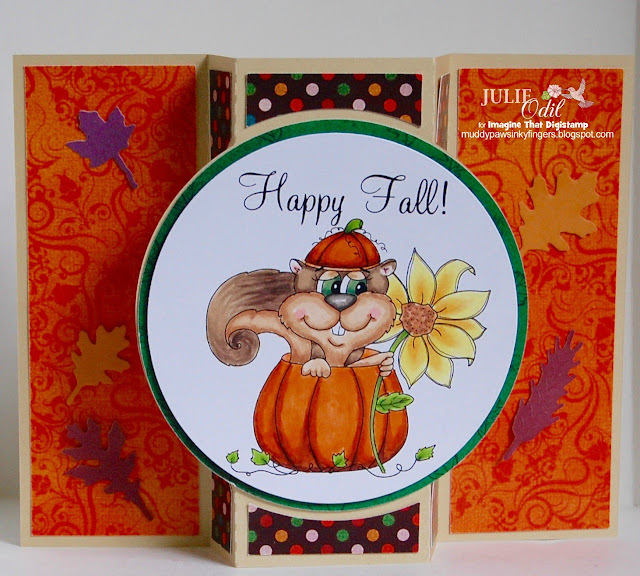 This is my first individual post on the MHKDesigns blog, and I have a fun, fun card to share! I used the Tree Frame from the "I've Been Framed" set, and printed it on one of the Fabulously Fall digital papers. The 'Trick or Treat!' sentiment is from the MHKDesigns Halloween Party digital stamp set. 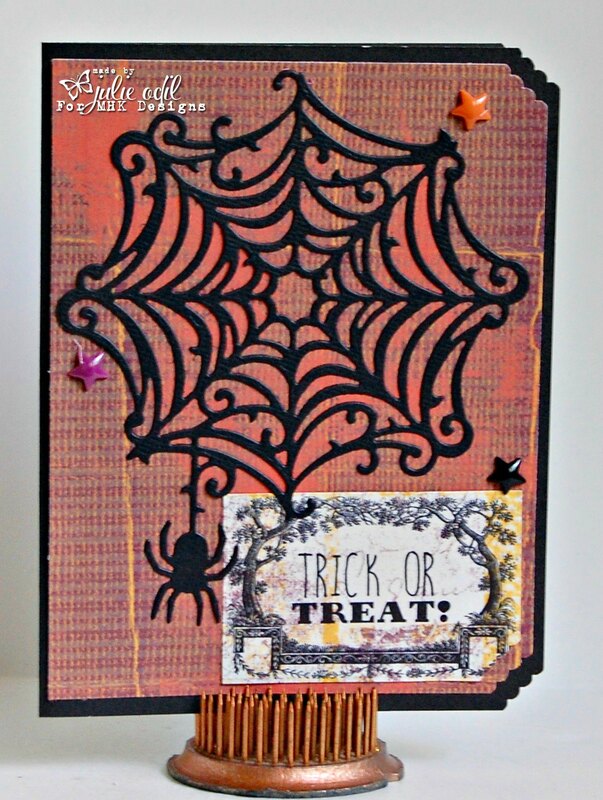 The spider web die was cut out with a die from Hot Off the Press, and placed on another digital paper from the Fabulously Fall Digital Paper Collection. Enamel stars are from Close To My Heart. I used a We R Memory Keepers corner chomper on some of the edges. Come back often to see what the other fabulous designers at MHKDesigns are up to. You won't be disappointed! There's one week left for the current challenge, then another starting soon. Come check out the MHKDesigners & Friends Facebook group, too! 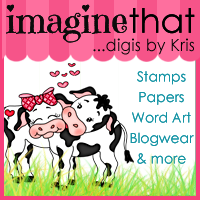 Here we are, on the 3rd month of my guest designing for Imagine That! Digis by Kris already. It must be true -- time flies when you're having fun, because I'm certainly enjoying myself with these wonderful digis and papers! Fall is upon us where I live. While on a motorcycle ride Sunday, my husband and I saw many trees beginning to turn, the geese are having flying lessons with their young each day, and the song birds are migrating through. Squirrels, too, like Humphrey, are busy getting ready for winter! I colored Humphrey's Sunflower with Copic markers. Papers for this card are from the IT! 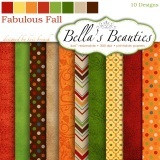 DBK Fabulous Fall Digi Papers. 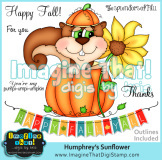 The sentiment is part of the Humphrey's Sunflower stamp set. The card was cut out on my Silhouette Cameo, using a file I found in the Silhouette Design Store. 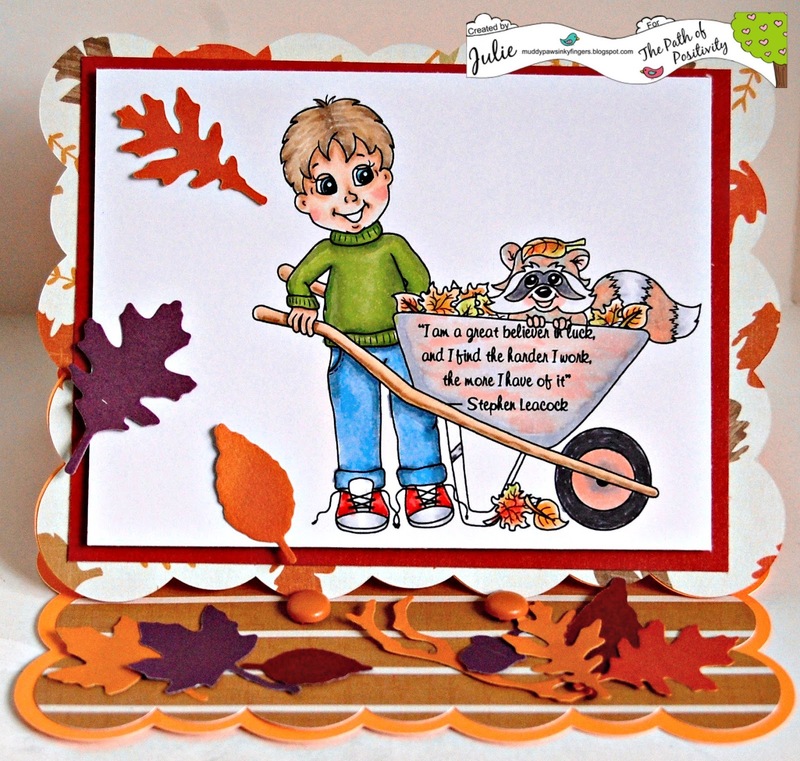 The fall leaves are a Sizzix die -- Alterations, for Tim Holtz. Imagine That! Digi Playground has an Easy as 1-2-3 challenge going on right now. 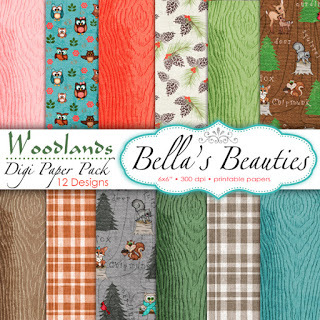 I'm going to enter this: 3 designer papers, 2 circles, 1 adorable squirrel! I hope you visit the Imagine That! 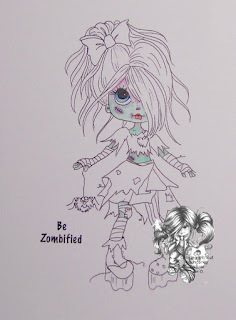 Digi stamps blog to see much more inspiration, and to join in the challenge. Greetings, fellow crafters! I have a couple of fun cards to share this afternoon. I used a band aid from the papers, cropped it, enlarged it, and wrote the appropriate text inside. Then, it was just a bit of fussy cutting and backing with black card stock. The crinkle ribbon is from 3 Girl JAM. I had great fun experimenting, playing, and creating! Thanks to Kris at Imagine That! Digis by Kris for the awesome papers to design with. Fun, fun, FUN!!! Hello, and Happy Sunday! We're edging ever closer to Halloween. I'm not a huge Halloween fan, but I do like the cute, kids in costumes, let's go trick-or-treating side of the holiday. 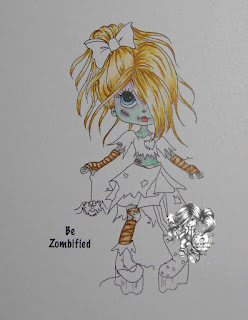 Today, I am posting on the Lacy Sunshine blog, and I have a tutorial on how to color zombie skin. Follow along below, if you're interested! 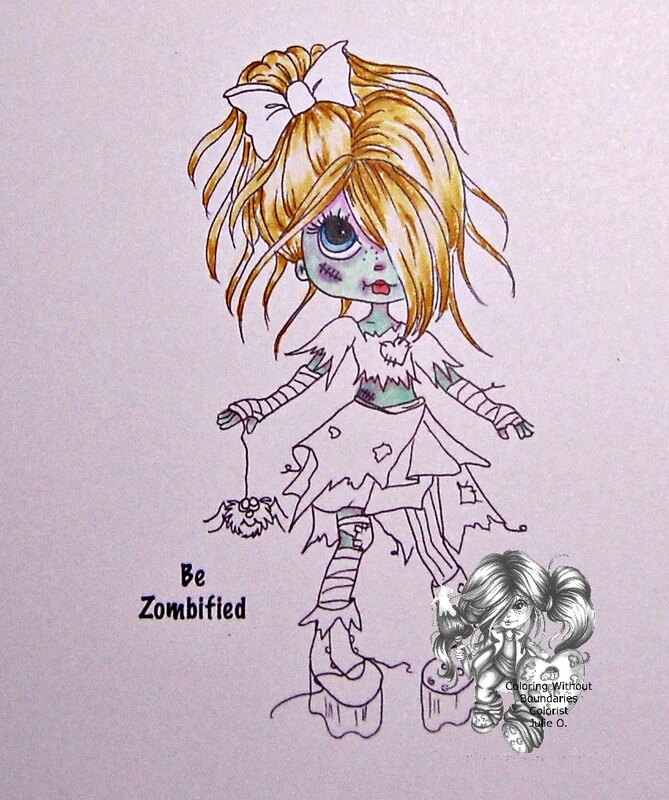 This image, from Lacy Sunshine, is Be Zombified! from the Rory Be Happy Coloring Book, available at Amazon.com. 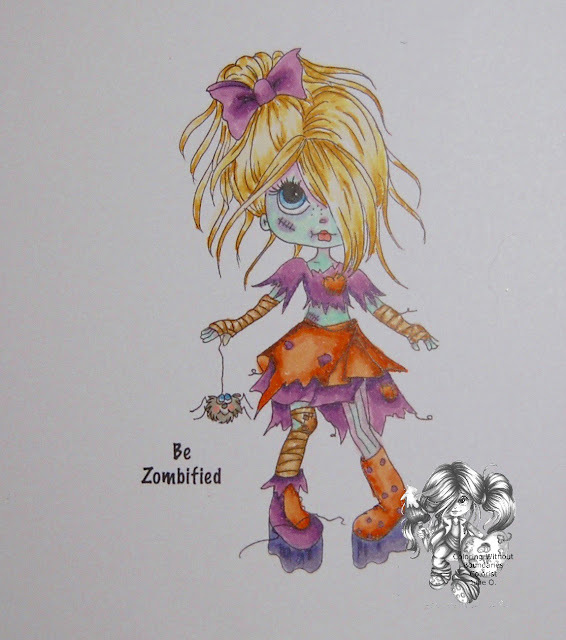 Zombie skin. I've never seen a zombie. 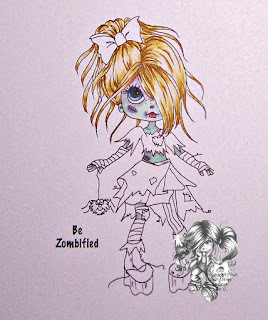 I don't watch any zombie shows (not even The Walking Dead), so really, who's to say what a zombie looks like. This gives the artist pure artistic license, so have it, right?!? Papers for this card are from Close To My Heart. 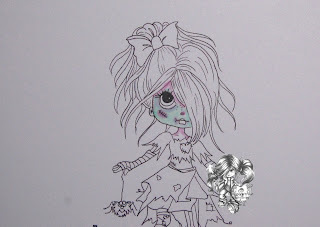 I distressed the edges to add to the zombie effect. 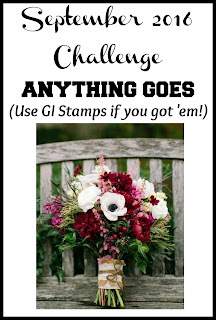 There's an anything goes challenge happening on the Lacy Sunshine blog, so come join the fun! I have 2 Facebook groups for you to check out, too. There's the Lacy Sunshine Color N Craft Community and the Coloring Without Boundaries Facebook Group. Both are wonderful, supportive communities to show your work, get inspired, and hear of sales and news. I'm posting today for Great Impressions Stamps, and that always makes me happy. So do these two friends! This just brings a smile to my face! 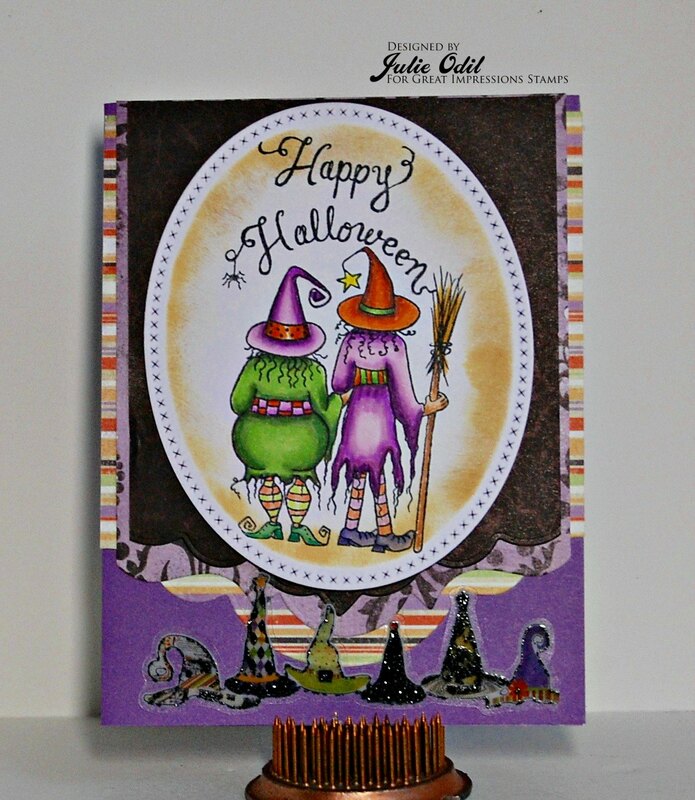 This witch rubber stamp from Great Impressions stamp is called F558 Double Trouble. The sentiment is E811 Happy Halloween. I colored F558 Double Trouble with Copic markers, then inked the edges with several colors of Tim Holtz distress inks. Papers for this card are some old Halloween papers from Fancy Pants Designs. The witches hat border is part of the collection also. I used a variety of dies on this card. The oval cross stitched die is from Die-namics. The edge dies are from Hot Off the Press. 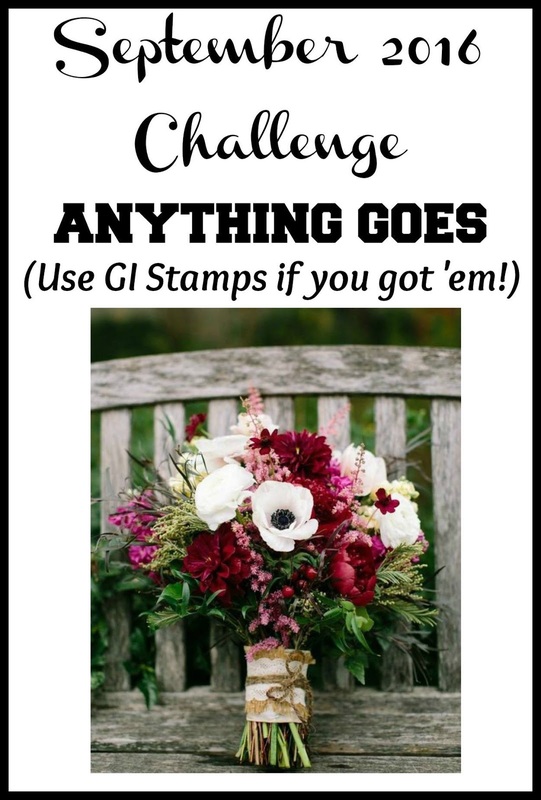 There's a challenge going on at Great Impressions Stamps. It's always Anything Goes, but there's an inspiration board if you need a jump start. Also, for these great stamps, and many, many more, shop the Great Impressions Stamps Store! I have the pleasure of guest designing again today at The Outlawz Twisted Thursday Challenge Blog. This week, the twist is 'spinning in circles'. You can enter anything, or take on the twist -- the choice is yours. I colored this happy Pond Casanova with Copic markers, then used a variety of circle dies to create the card. Papers are digital, and were found at Snap Click Supply. 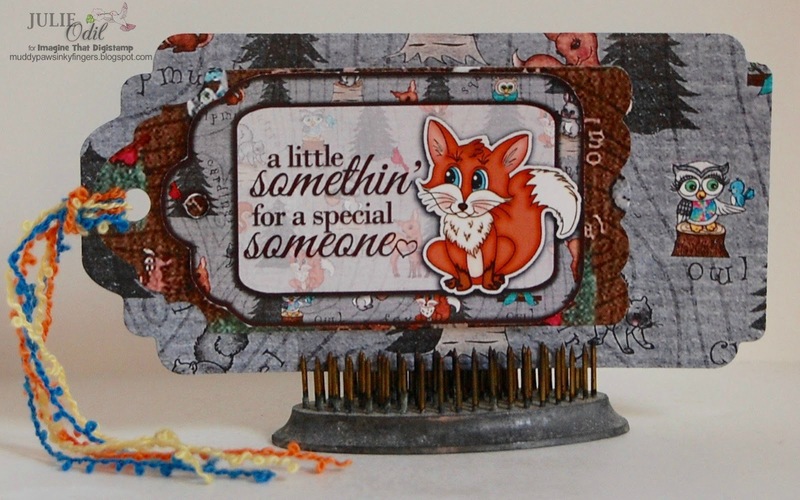 The sentiment is from Spellbinders Paper Arts. The luscious crinkle ribbon is from 3 Girl JAM. 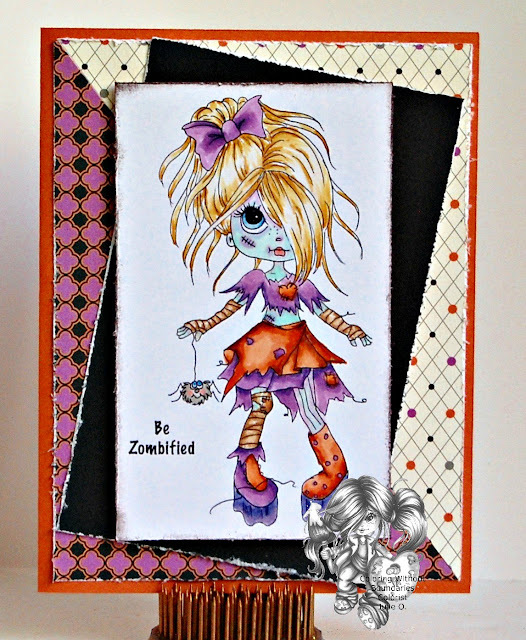 Thanks to Angela and the Twisted Thursday team for having me guest design again today. As always, it was a very enjoyable experience! 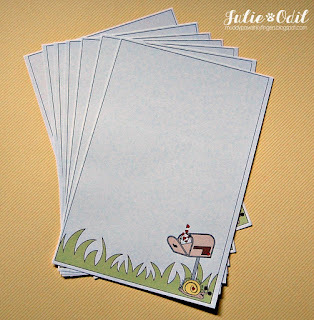 Thanks to DigiStamps4Joy for the great digi to work with! Please join in on the Spinning in Circle challenge this week at Twisted Thursday! 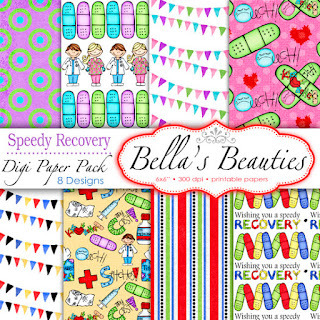 This is day 2 of New Release week at Crafty Sentiments Designs. You can find all the new releases on the Crafty Sentiments Inspirations blog, beginning with yesterday. All the New Release rubber stamps will be available in the Crafty Sentiments Designs Store on September 10. I colored Isobel - Flower Pot with Copic markers. The card base was cut out on my Silhouette Cameo with a file I found in the Silhouette Design Store. I used dies from Top Dog Dies to cut out the colored Isobel - Flower Pot image and to back it. 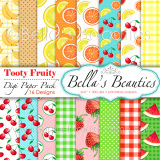 Designer papers are from MHKDesigns digital papers. The mulberry flowers are from Really Reasonable Ribbon. 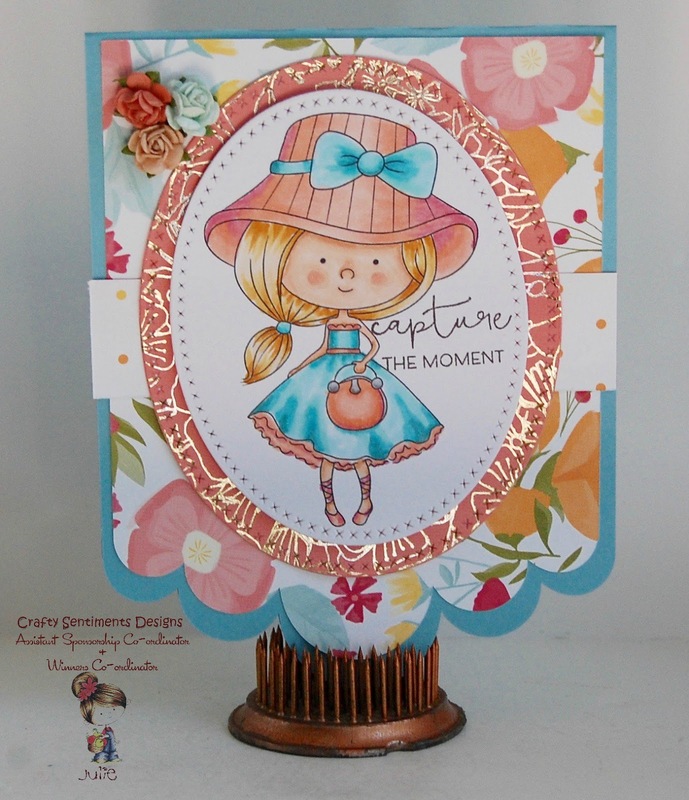 The sentiment is from Spellbinders Paper Arts. The card stock and glimmer trim are from Close To My Heart. 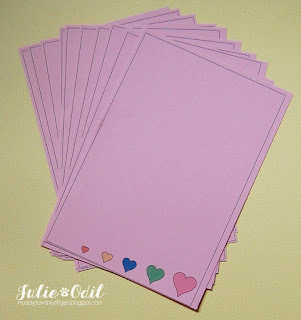 Don't forget to check out the Crafty Sentiments Inspirations blog for tutorials and wonderful inspiration all month long! 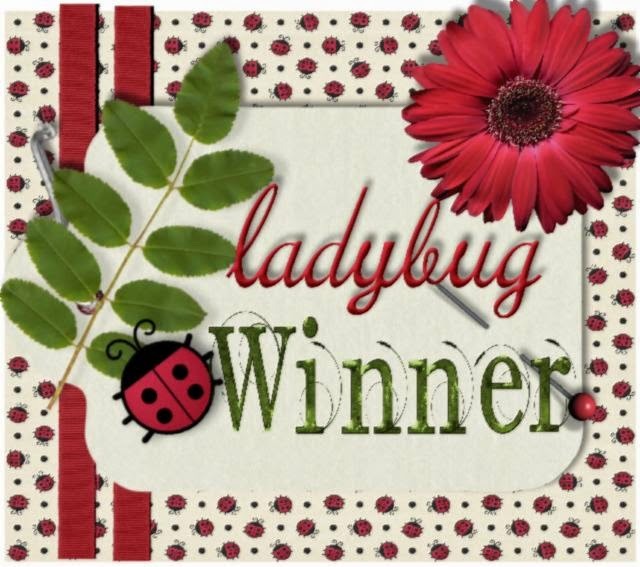 It's Tuesday, and it's time for a new challenge at Crafty Sentiments Challenge Blog. This week, the theme is the always popular, Anything Goes. Come join the fun! Today is also the start of New Release week at Crafty Sentiment Designs. Check the Crafty Sentiments Inspirations Blog each day this week to see the other wonderful new rubber stamps. 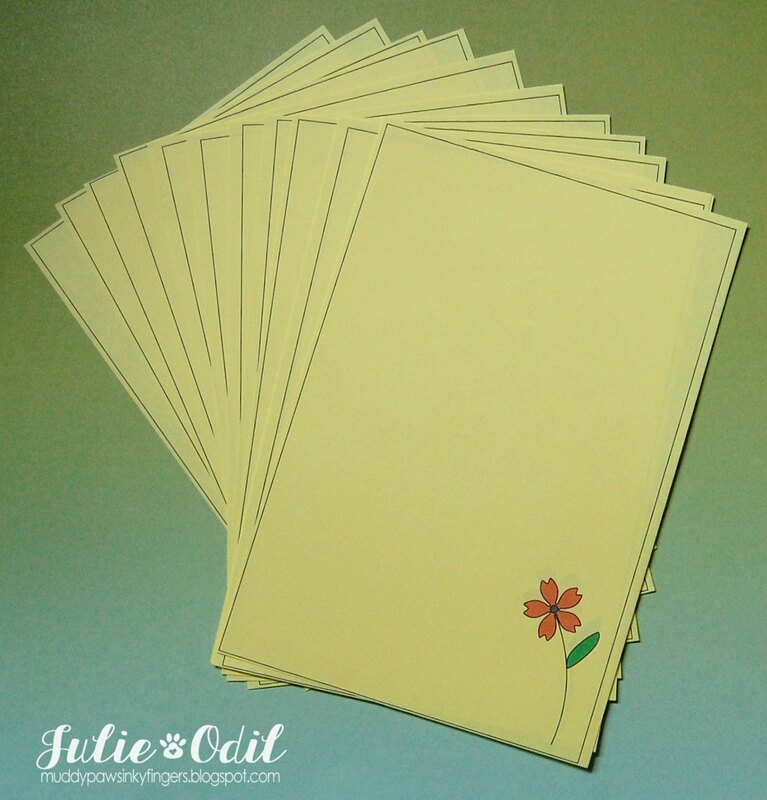 They will all be available in the Crafty Sentiments Designs store on September 10. 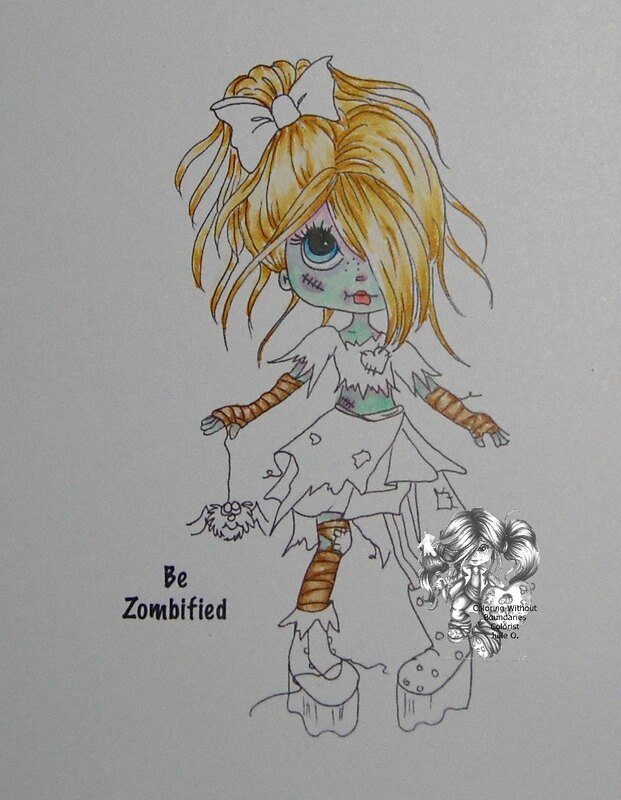 I colored Bella - Party Dress with Copic markers. The papers on this card are from Close To My Heart. The card base, from Pretty Paper, Pretty Ribbons, was cut out on my Silhouette Cameo. The mulberry flowers are from Really Reasonable Ribbon. I hope you join the Anything Goes challenge this week at Crafty Sentiments Challenge Blog. I'd love to see what you make, and there's great prizes to win! 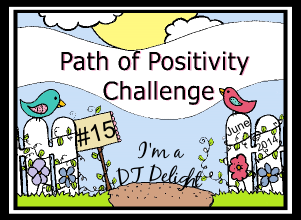 It's a new month, and time for a new challenge at the Path of Positivity Challenge blog. This month's theme is luck. There's lots of directions to go with this one! Each of our guest designers is offering a $10 gift certificate to their store! I think that's one lucky raccoon, too, riding around in that wheelbarrow, getting out of all the hard work. I colored Hitchin' a Ride with Copic markers. The easel card is a file I found in the Silhouette Design Store, and cut out on my Silhouette Cameo. The papers are from Photo Play. 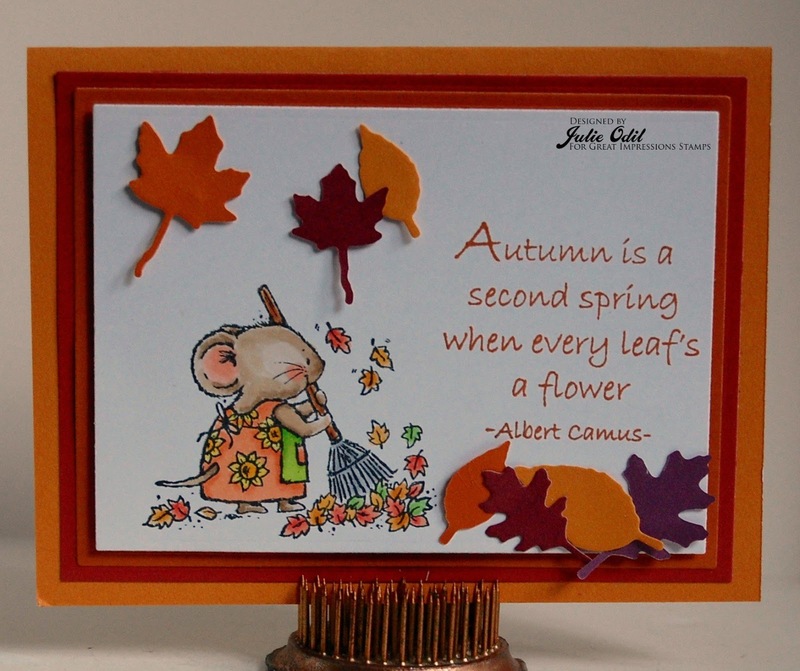 The leaves, branches, and acorns are a die cut from Sizzix. I hope you join us this month at the Path of Positivity Challenge blog for our lucky challenge. There's great prizes to win and lots of fun!